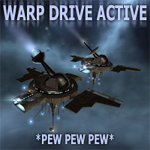 I grab a wormhole vet to talk a bit about the latest expansion for EVE entitled Incursion. I stick a microphone in front of Digital Solaris (full-time forum whorewarrior), who rants with me about the current state of EVE. Like well… everyone else seems to be doing these days. I apologize in advance for the wonky quality of the interview section of the recording. I get a chance to sit down with the kind folks from CCP involved in organizing the upcoming Alliance Tournament 8, as well as the expert players who will be commentating the matches. We find out what kind of work goes into the preparation for EVE’s tournaments, and what we can all expect from this one. Why, there may even be a surprise announcement or two thrown in for giggles, so have a listen and enjoy! Podcast #53: Did You Just Blow Me a Kiss? I try to get as many random people as possible to talk about Tyrannis with zero notice. I manage to catch Yon89 while he’s at work, and interrupt Shou Ning’s evening watching movies with his kiddo. In typical fashion, we end up talking about cows, Avatar, and some sort of upcoming expansion for EVE. Oh, and we get spammed, live. EVE’s zombie podcast arises from a three month death! :) I talk with Shou Ning about EVE’s next expansion named Tyrannis, and about some of the more recent activities in the game. Additionally, this episode includes part two of the EVE retrospective recorded some months ago by myself, Zapatero of EON, FinnAgain of EVE Tribune, and LaVista Vista of EBank. Yesterday I had the pleasure of sitting down (virtually speaking of course) with Zapatero of EON, FinnAgain of EVE Tribune, and LaVista Vista of EBank (lol), and we had a nice discussion about the last year in EVE, and where we think it’s going in the next year. This is the first of three parts, and I’ll be staggering their release between normal Hot Drop episodes. Enjoy! 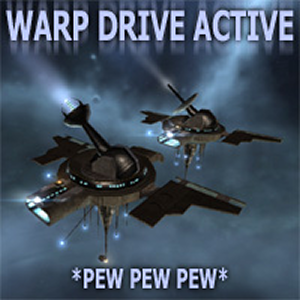 In other news, apparently I totally missed the Warp Drive Active birthday a few days ago, so go me. :) A new comic is coming soon though, so woot. Behold, out of the darkness comes a new podcast. Sporting a new format (please comment on likes/dislikes!) that is leaner and more community-driven, I hope to involve more people in the madness that is WDA. Listen for more information on this. One big improvement is that I’m not going to use VirginWorlds anymore for this, since the days-long delay in getting the file on iTunes was frustrating me to no end. This won’t be an issue going forward, once the new syndication feed goes up on that service. Update: iTunes feed is up and working. Click the icon below to subscribe, back catalog for the new feed will be available over time.